When I was growing up, watermelon was my dad’s drug of choice for me and my four siblings. No matter what was wrong with me, Dad believed that watermelon would solve the problem. And if Mom wasn’t around, watermelon was usually exactly what I got. I remember feeling feverish and sitting down with a big bowl of watermelon for comfort. Sure enough, it helped me feel better. Now that I’m older, I know that it wasn’t just an emotional response that was improving my condition. In fact, the Chinese have valued watermelon for its “cooling” properties for centuries. Now research is confirming that watermelon is full of valuable nutrients and phytochemicals. These nutrients include vitamin A, vitamin C, vitamin B6, vitamin E8, potassium, beta-carotene, citrulline, and lycopene. Vitamin C is a powerful antioxidant and anti-cancer agent, and it partners with B6 and E8 to lower blood pressure. The beta-carotene and vitamin A keep your eyes, immune system, and skin healthy, while potassium protects your nerve and muscle function, lowers blood pressure, and puts you at less risk of kidney stones, stroke, and bone density issues. If you’ve been a reader for long, you’ve heard me talk about the importance of nitric oxide to the cardiovascular system. Citrulline is converted into arginine in the kidneys. L-arginine is converted in our bodies into nitric oxide. Nitric oxide, or NO, encourages our blood vessels to widen and naturally improves blood flow, lowers blood blood pressure, and can even help relieve headaches. But arginine’s benefits don’t stop there. The amino acid also contributes to protein production, improving muscle growth and wound healing, fighting fat deposits, and supplementing the immune system. A lack of arginine has been linked to renal carcinoma, chronic inflammatory diseases, and blood cell diseases. Since citrulline is more bioavailable than arginine, eating watermelon may be a great starting place for disease protection. Citruilline’s cardiovascular effects also mean that it can help lower blood pressure. One study of obese participants with nearly high or high blood pressure saw significant improvements when they consumed citrulline from watermelon. Citrulline also improves glycemic control and circulation in people with diabetes. When you think of lycopene, you might think of tomatoes first. But it’s common in many red foods, including watermelon, papaya, and grapefruit. This antioxidant fights oxidative stress throughout the body, offering protection against heart disease, Alzheimer’s disease, and cancer. It also lowers LDL cholesterol and has been found to reduce stroke risk. With all of these benefits, it’s no wonder that watermelon helped me feel better as a kid. I continue to eat it as an adult, both because I have fond memories of it from my childhood and because I know it’s benefitting my health as I age. 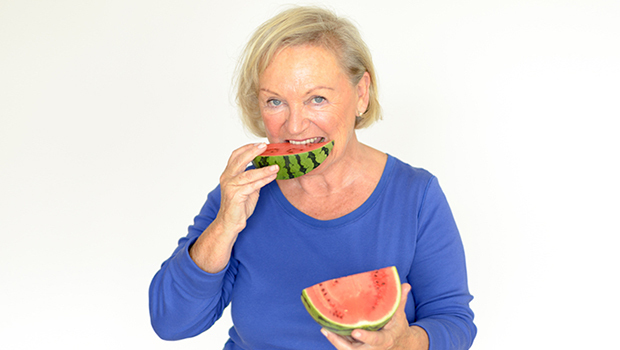 If watermelon makes you nostalgic too – or if you simply want to increase your chances of remembering other fond memories as you age – grab a bowl full of watermelon today. It’s a great nutrient-rich snack.